In The Face Of A Bloodied Boy, A Call To Look More Deeply At Syria Prompted by the image of a little boy in Aleppo whose face is caked with rubble and blood, NPR's Scott Simon reflects on the costs and effects of the war in Syria. Omran Daqneesh sits in the back of an ambulance after he was injured during air strikes in Aleppo. 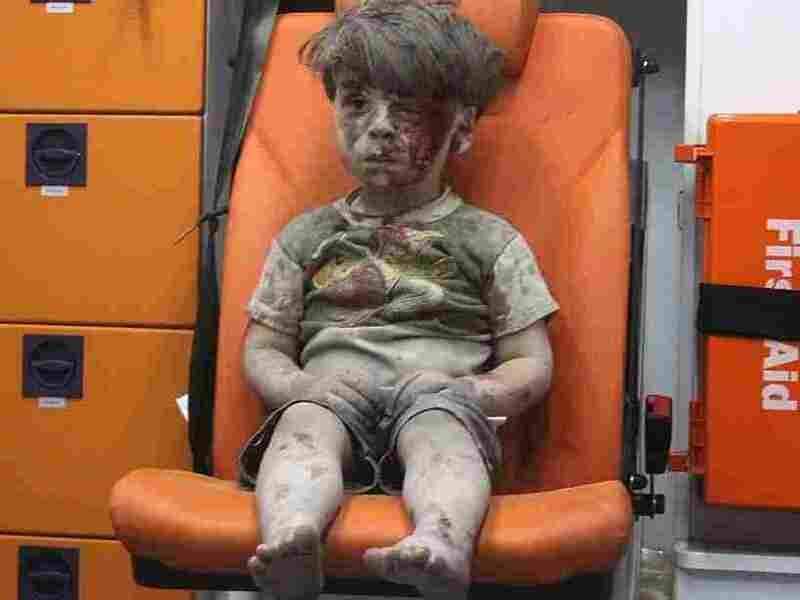 The little boy in Aleppo, sitting in an ambulance, his face caked with rubble and blood, is named Omran Daqneesh. He is five years old. His home was destroyed on Wednesday night. Russian and Syrian government airstrikes have become routine in rebel-held areas of the city. And rebels have also shelled the government-held side. Omran's legs barely reach to the edge of the seat. In a video and photos that went around the world this week, taken by the pro-opposition Aleppo Media Center, you see the little boy reach up, as if to wipe a tear. Then he takes his small hand down, and looks at his palm, for blood or mud. Then you notice he is out of tears. His eyes look dry, dazed and worn out. The Little Boy In Aleppo: Can One Photo End A War? The boy is utterly quiet. He doesn't scream. He doesn't cry. The little boy looks tragically resigned to the bombs, blood, and screams that run through his world. Aleppo has been besieged by war for almost all his life. Local reports say that Omran and his parents and three siblings were all rescued from the rubble of their building. But it's hard to imagine they'll be safer anytime soon. The statistics with which we report the war in Syria are astounding. The U.N. stopped counting at 250,000 dead. The U.N. Special Envoy for Syria estimates 400,000 have been killed. Amnesty International says nearly 18,000 have died in state jails of the regime; many more have been tortured. Roughly 1 in 4 refugees in the world today, almost five million people, are Syrian. Many risk their lives to leave, rather than stay in place that seems to offer only the certainty of death, while international figures conduct long conferences to no result. I know we can see other children with dazed, dead eyes, who are victims of violence in Iraq, Yemen, and for that matter, Chicago and Baltimore. But war in Syria has thrown sparks of savagery and terrorism around the world. It prompts memories of genocides in Bosnia, Rwanda, Darfur, and other modern killing grounds where the world looked away. This week Nick Kristof wrote in his column in the New York Times that when he describes others' ideas to end Syria's civil war, including strikes to put craters in Syrian military runways to prevent planes from taking off to bomb civilians, he has received what he calls, "a torrent of comments, many laced with a harsh indifference: Why should we help them?" This week, maybe the face of a small boy, silent and sad-eyed in a hellish landscape, will provoke more people to look more deeply into Syria, and themselves.